rocol expert What is Anti-Seize? Anti-Seize expert, Chris Dyson, answers some frequently asked questions that arrive at our tech desk. 2. Why use Anti Seize? Some anti-seize products are designed for dynamic systems. 3. Where should Anti-Seize be Applied? Essentially, when required, a thin layer of anti-seize should be applied to each interface in an assembly. This should ensure the best protection of the interfaces in the system. A thin layer is sufficient – Any excess will be squeezed out during tightening. 4. How much Anti-Seize should be Applied to a Surface? A thin layer is sufficient. For a typical fastener assembly, a film approximately 0.1mm thick is suitable. Some guidance recommends completely filling thread valleys of a bolt with anti-seize. However, as excess anti-seize is squeezed out under tightening, this quantity is excessive and often wasteful. A thin layer is recommended. With an aerosolized anti-seize, the instructions on the Technical Data Sheet explain the best way to achieve a thin layer with uniform coverage. 5. What is the Best Method for Applying Anti-Seize to a Surface? Before application, ensure that surfaces are clean and free from oil, grease or contamination, especially if components are supplied oiled. For the application of a thin layer of anti-seize, a brush is normally most effective. Using a brush will produce a more even layer than using a gloved hand/finger, especially on threads. A brush should be used for one material only. If a brush has been used to apply a particular anti-seize compound, it should not be used to apply another, even if cleaned. Cross-contamination can affect performance. For an aerosol spray, following the instruction on the can and the Technical Data Sheet should produce an even layer of anti-seize on component surfaces. 6. How Should a Surface be Prepared before Applying Anti-Seize? Many nuts and bolts are supplied oiled to prevent corrosion in storage. It is recommended that any oil is removed before application of an anti-seize, so that it cannot affect the frictional properties of the anti-seize (then the bolt tension) or the corrosion resistance. 7. Does Anti-Seize Need to be Reapplied? Anti-seize compound is not like a bearing grease or gearbox oil in that it isn’t necessary to periodically replace it. Once applied, it is designed to last for the service interval of the interface. However, if a fastener is disassembled or an interface is parted, it is recommended that the components are cleaned and anti-seize re-applied. If fasteners are re-tightened or reused, caution should be used when choosing the torque settings, more info here . 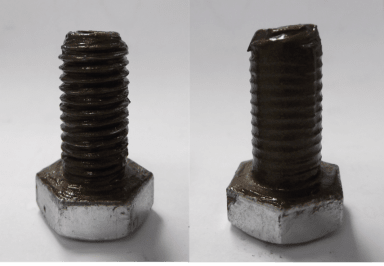 Because the surfaces of fasteners change as they are deformed under load, the coefficient of friction may not be the same the second time a bolt is used – Which might affect the final tension. 8. How Should an Anti-Seize Compound be Removed from a Surface? For cleaning an anti-seize compound from a component, a standard industrial degreaser (e.g. ROCOL Heavy Duty Cleaner or Remover & Degreaser Spray ) or solvent cleaner (e.g. ROCOL Industrial Cleaner Rapid Dry or Electra Clean) should be suitable. A brush or rag should be sufficient for the cleaning process – Abrasives are not recommended as they will damage component surfaces. • If a clean surface is required afterwards, a residue-free cleaner such as ROCOL Industrial Cleaner Rapid Dry or Electra Clean. • If the component will be stored, a corrosion inhibitor may be required to protect the surface e.g. ROCOL Moisture Guard, Z30 or FOODLUBE Protect.